Even as Opposition parties up the ante over alleged incidents of religious reconversion, the Dharm Jagran Samiti has declared that it will ensure India becomes a Hindu Rashtra by 2021. 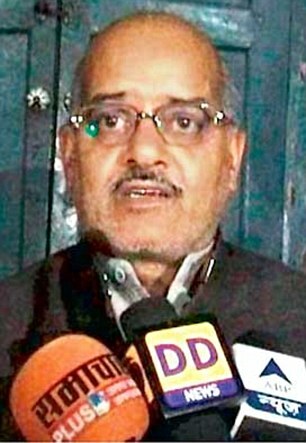 Speaking in Agra on Thursday, a Dharm Jagran Samiti (DJS) functionary said Muslims and Christians will have to convert to Hinduism if they want to stay in this country. The DJS has been at the forefront of the reconversion - or ‘ghar wapsi’ - programmes in recent times in which some Muslims have been reportedly ‘reconverted’ to Hinduism. However, their action drew widespread condemnation, leading to the arrest of one activist. “Our target is to make India a Hindu Rashtra by 2021. The Muslims and Christians don’t have any right to stay here. “So they would either be converted to Hinduism or forced to run away from here,” Uttar Pradesh DJS head Rajeshwar Singh said. He was reacting to the arrest of Nand Kishore Valmiki, a DJS activist. Valmiki was arrested on Tuesday for his alleged involvement in forcefully converting over 100 Muslims to Hinduism in Agra. Singh said although he has temporarily suspended his ‘ghar wapsi’ programme in Aligarh and some other districts of the state that were supposed to be held on December 25, it would be restarted soon. The DJS leader claimed that those who have been opposing ‘ghar wapsi’ were fearful of Muslims. But, he would set India free from this fear, he added. “I belong to the Solanki sub-caste within the Rajput caste. The Thakurs (Rajputs) respect me. I am their leader and they follow my orders. “The Muslims had converted Rajputs to Islam by force. But the Rajputs are rising again. “I will ensure that India is freed of Muslims and Christians by December 31, 2021,” Singh said. In Etah, Singh reiterated his stand, saying he wouldn’t let Muslims and Christians convert the Hindus. “We will not let them hunt the Hindus,” he said. “The enemies have tried many a time in the past to finish Hinduism. But every time, Ram, Krishna and Chanakya came forward to finish them and restore the glory of Hinduism. 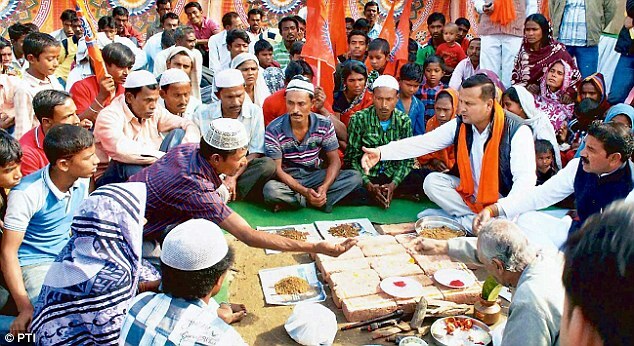 Explaining the DJS’ plans, Vishva Hindu Parishad (VHP) secretary general Champat Rai told Mail Today: “We are of the view that there are a handful of Muslims in India. “Others within the Muslim community are actually Hindus. Their ancestors were converted to Islam forcefully. Rai claimed ‘ghar wapsi’ has been an ongoing VHP campaign for the last 60 years. A resolution in this regard was passed during the 1966 Maha Kumbh in Allahabad, he said. “We have re-inducted over six lakh people into Hinduism since 1966. “Mahatma Gandhi, Savarkar and Swami Dayanand Saraswati had expressed their concern over religious conversion. “They believed it was poisoning the society. Bringing them back to their original religion means correcting the wrong. "It is the appropriate time now to take it up on a bigger scale,” he added. A Rashtriya Swayamsevak Sangh (RSS) leader told Mail Today that they have formed committees in every district of the state for this purpose. “We have included some Arya Samaj priests in the team because they issue a certificate to a converted person. "This is a major document to prove that the converted person agrees to it,” he said. When asked about the posture of the Modi Government on this issue, he said: “We never ask Modi or any other BJP leader before chalking out our strategy. “We only expect them to speak for or against us to clarify their stand. But Modi is the Prime Minister. UP minister Azam Khan said: “RSS is behaving like the Taliban. They don’t want the Constitution of India. Meanwhile, reacting sharply to the DJS statement, Congress general secretary Digvijaya Singh said: “DJS is a wing of RSS, which had supported Modi and the BJP during the Lok Sabha elections. He dared the Modi Government to either accept the activities of DJS or “show some guts” and disband it.